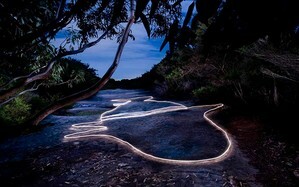 Peter Solness specialises in the photographic method of Light Painting. This involves mounting his camera on a tripod and working in darkness, hence allowing long camera exposures of between 4 to 60 seconds. These long exposure times means he can hand-illuminate his chosen subjects using small torches to create other-worldly effects, not usually associated with tradtional photography. "Light painting is my personal endeavor to remain engaged and inspired by the act of photographing. Photography has always been my medium, my voice, and the way I make sense of the world around me. I began as a 16 year old, raising my eye to a camera and seeing the world in a different way. It’s just what I do, and in the 43 years since those first exposures were made onto Kodachrome 64 film, photography keeps me engaged. It feeds my internal dialogues and is the way I see myself reflected in the world around me. It contextualizes me and gives me a proximity to ideas I would otherwise not value. Light painting takes me away from iPhone selfies, six-frames-a-second coverage, brashness, attitude, flashguns, fashion and bland repetition. No two images are the same with light painting. Each exposure is an expression of light and how light can direct the execution of an idea. Light painting has been my way of placing a value on things that I feel should be appreciated. Not in a strident way, but in a disarmingly beautiful way. There is an almost devotional aspect to the way one needs to present torchlight to a subject, something that takes my practice into quasi-ritualistic dimensions. It is as much a performance as it is the execution of a photograph and with performance there is also the opportunity for playfulness in the way I develop ideas and undertake the creation of my images. So these images are my refuge, where I can find some clarity, beauty and quiet sanity. I hope you enjoy them and that they echo something of the appeal that I’m making within myself as I create them. That to go into a dark place, set up a tripod and to painstakingly illuminate a tree, a rock, an Aboriginal engraving site, or a fellow human being, is an act of gratitude." Peter’s fine art works have sold extensively and are held in many public and private collections, including the National Library Canberra, State Library of NSW, Museum of Sydney, NSW Parliament collection, Macquarie University Gallery, Pat Corrigan Collection, Ballarat Fine Art Gallery, Muswellbrook Regional Arts Centre and the Port Noarlunga Arts Centre. 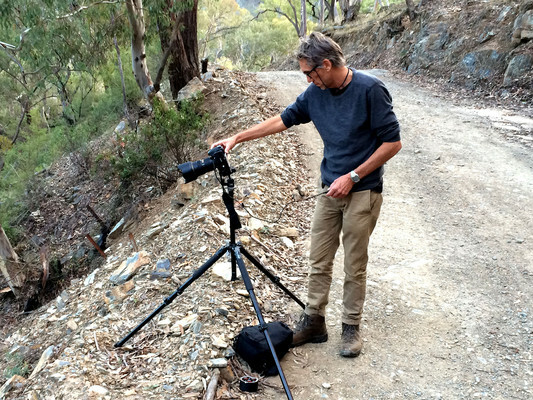 In 2010 and again in 2014, Peter was awarded the prestigious NSW Parliamentary Plein Air Photographic Prize, for one of his light painted images. Peter has held large solo exhibitions of the 'Illuminated Landscape' works in major public galleries. 'Nocturnal' a light-box installations at Customs House, Circular Quay, Sydney, in 2009-2010 and 'The Light Painter' at the Manly Art Gallery and Museum, Sydney, in September/October 2012. His exhibtion 'Lamplight' based on his work as an artist in resident at Hill End will be shown at the Bathurst Regional Art Gallery from 7th June to 28th July 2019. As an enthusiastic exponent of light painting, Peter creates public light events for national art festivals such as the 2016 and 2017 Cairns Festival, 2016 and 2018 Hill End 'The End' Festival and the 2016 and 2018 Seechange Art Festival at Jervis Bay. Such events have had as many as 1,000 spectators attending. Peter also develops specialist light painting workshops which are tailored for general photo enthusiasts and camera clubs as well as for more targeted groups, such as primary and secondary school students and tertiary-level art students at teaching institutions such as the National Arts School, The Australian Centre for Photography and the CATC Design School. Over the past ten years Peter has introduced the magic of light painting photography to thousands of inspired students.